The current ESSEX COUNTY COURTHOUSE in Tappahannock, Virginia, dates to about 1851, although one wall of its 1729 predecessor still survives on the site. 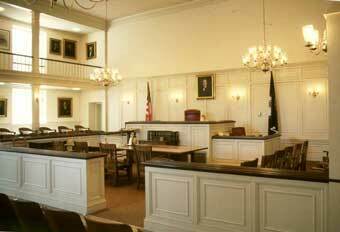 It is built around the Circuit Courtroom, which also displays a rail (in this case a paneled partition) surrounding the judicial area. 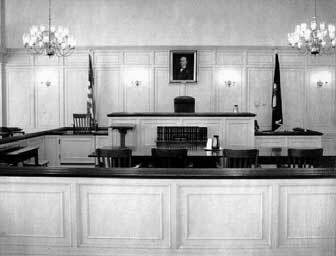 Again the symmetry and balance is evident, as the two views illustrate, and the jury box is outside the wall balanced by additional seating on the side opposite.